In an attempt to break up a stressful week, Teachers Insurance Specialists served waffles to the staff at Riverside Elementary School. The event was called the “Wacky Waffle Wednesday.” For the next two weeks most students in the State of Florida will be undertaking the FCAT exams. As the teachers administer these tests, the stress levels are felt by everyone! 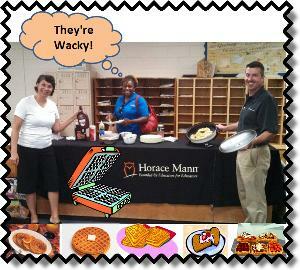 The “Wacky Waffles” were a welcome break for the staff & created some light hearted moments, as well as full stomachs! If you would like to recognize your staff or create a positive moral boosting event, please call Teachers Insurance Specialists. Not only can we save you money on your insurance needs, but we are good cooks as well!